This is one of my favourite dinners. It feels so indulgent that you’d never think it was so wholesome. Salmon is full of omega 3 fatty acids, which are known to help lower blood pressure and reduce your risk of heart disease. The NHS advise that you have 2 portions of fish a week, one of which should be oily, like salmon. 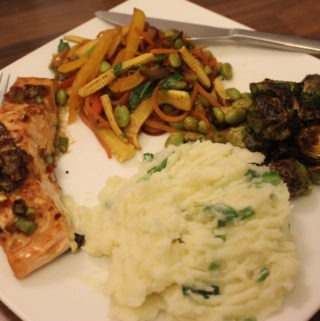 The salmon here is lightly marinated in a gluten-free ginger and soy mixture and baked in the oven until it is moist and flaky. I cannot advocate potatoes enough – they are virtually fat-free, incredibly cheap, and 100% naturally gluten-free. So why shouldn’t they dominate a gluten-free diet? This mash is mixed with a splash of milk, spring onions, and a drizzle of deliciously toasty sesame oil. Mash: next level. And I am ever the proponent of plenty of veg! I love all the colours in this meal. The simple brussel sprout does not have to be kept for Christmas – and it doesn’t need to be boiled and soggy. I roast my sprouts in the oven, helping them to release their natural sweetness, then coat them in tamari and honey. You wouldn’t find this in a restaurant, and you almost definitely wouldn’t find it gluten-free, which is why I love cooking from scratch so much. You can experiment with so many different flavour combinations and create delicious, hearty meals that cater to your specific tastes and cravings. 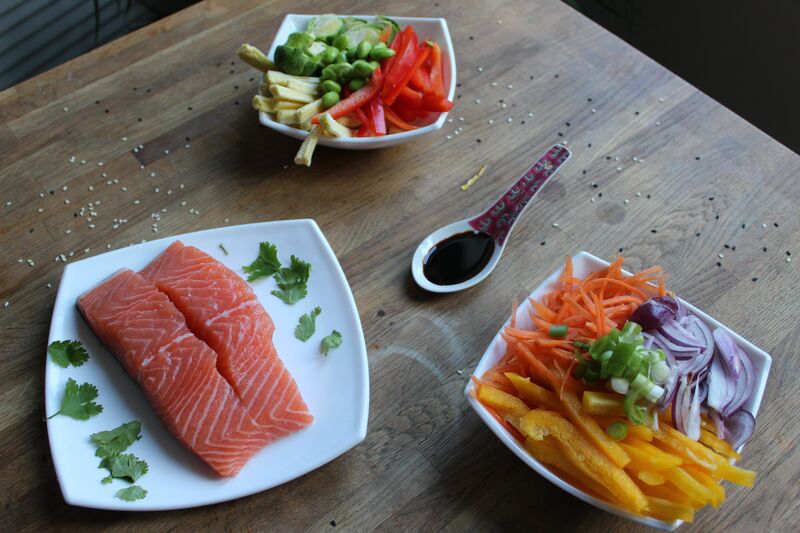 Mix your marinade and pour it over the salmon. Refrigerate for 30 minutes. Meanwhile, toss the brussel sprouts in vegetable oil and place on a baking sheet. Roast for 30-40 minutes. After 10 minutes, place your salmon in a glass dish and bake in the oven (this should take 20 minutes, so you can prepare your mash and veg in that time). Whilst your sprouts and salmon are in the oven, bring chopped potatoes to the boil in a pot of water. Boil for around 10 minutes until soft enough to mash. Fry off onion and pepper in a wok while your potatoes are boiling. Keep an eye on the wok while you drain the soft potatoes and return them to the pan. Toss in carrot, remaining spring onion, tamari, rice vinegar, lime juice and sesame oil into the wok and heat through. 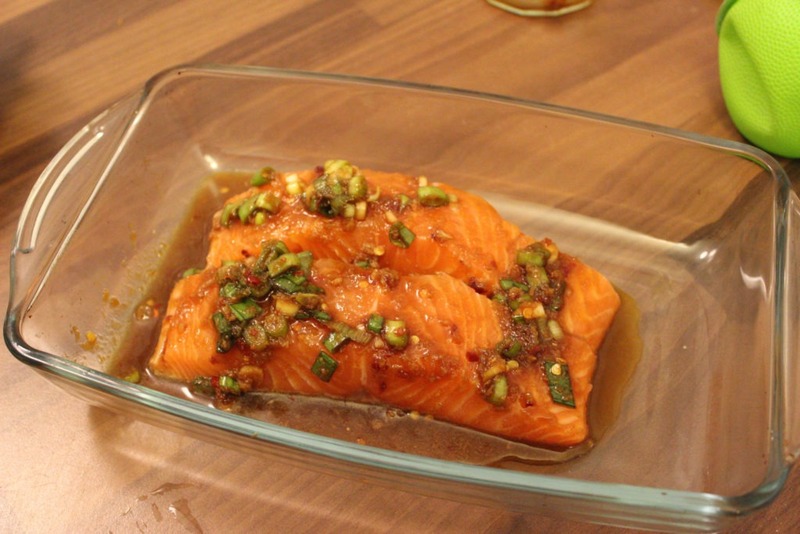 By the time this is ready, your salmon and sprouts should be done.